This is a mixed loop whose biggest highlight and main purpose is a descent on the singletrack Big Rock Trail. Given the rarity of decent singletrack of satisfactory length in Marin outside of Tamarancho and China Camp, this 2.5-mile-long nice and scenic trail should count as a treasure. While it may not be challenging enough to set the hearts of hard-core mountain bikers aflutter, it's a scenic singletrack that's pleasant and mellow. It's just that there isn't a convenient way to reach its upper end in order to incorporate it into a loop as a descent. The easiest way to reach its top might be to climb Big Rock Trail itself. In fact, that might well be the best way to experience this trail, as an out-and-back ride (albeit a short one). That's not what I've done on this particular ride, however. On this ride, I used Big Rock Trail as part of a larger loop, mostly to be able to sample more of the surrounding trails at the same time. This ride's starting point is a tiny nub of a dead-end street in Lucas Valley, called Mt. Dana Court. There's enough space for no more than 8 to 10 cars there. Street parking is allowed in the surrounding neighborhood, however. And, if all else fails, there's quite a bit of head-in and parallel street parking available along the wider Miller Creek Road, just downhill from the short stretch of that road covered on this route. The whole point in starting this ride from an obscure back street is to boost the trail mileage a little bit on this loop by adding the short Idylberry Trail to the ride, because this route would otherwise cover almost half of its length on paved roads. This trail stretches a short distance along the backs of the homes on the boundary of the adjoining neighborhood. It turns out that this stretch is a pretty enjoyable and rewarding part of the ride, since it happens to have some of the most technical stretches of trail along this entire route. Idylberry Trail alternates between a singletrack and a rocky and rutted fire road. The only thing is that this trail has plenty of repeated ups and downs, most of which are fairly steep, so it's pretty strenuous. Putting it this way may give you an idea: you do about 250 feet of total climbing on this little trail that's barely a mile and a quarter in length. That's quite a lot when you consider the fact that you end your stint on this trail with a net elevation loss. Following Idylberry Trail, after a very short distance (and three left turns) on residential streets, you return to trails when the big fire-road climb starts at the end of the tiny Queenstone Drive. This climb is tough by any standard. It turns brutal as soon as it begins. After a very short respite that follows the first of many stretches with 20-plus-percent grades, you go through a half-mile segment whose overall average grade is over 14.5%. You're never free from that level of steepness over the rest of the climb all the way to the peak, but at least short breaks in the climb are a bit more common for most of the way up. Still, what awaits you before the peak also includes another unbroken half-mile stretch that averages nearly 13.5% grade end to end, and one more that's over a quarter mile in length whose average reaches a touch above 17%! My GPS track for this climb shows at least 12 spots where the grade exceeds 20% and three of those exceed even 25%. I happened to do this ride at a time when I was relatively out of shape and ended up walking all sections of the climb that have a grade at or above 15%, which felt like most of it. On top of the toughness of the climb, there are a few short descents added to the mix on the way up that cost you an extra 500 feet or so. In the end, you incur 2300 feet of cumulative elevation gain in 4.5 miles. Having shared with you the bad news about the climb, there is also a silver lining I need to mention, and that's about the views. You get expansive views from a reasonable number of spots on the way up, even if most of the good views will require you to remember to look behind you. I can't say that the views are enough to distract you from the painful climb completely—they are only sporradic, after all—, but the struggle to the peak would certainly be a much more gloomy one without them. In fact, the views don't desert you during the descent after the peak either. There are only a couple of wooded patches on Big Rock Trail, and the rest of that trail gives you a lot of scenery to look at almost all the way down to Lucas Valley Road. It's a little interesting to notice when looking at the elevation profile plot that the distance from the beginning of the climb to the peak of the ridge and the distance from there to the bottom of the descent on Big Rock Trail are roughly the same, because, during the ride, it felt to me like the distance to the top was four times as long as the descent is. In fact, the ratio of the duration of the climb to the duration of the descent is certainly closer to that. While there aren't that many technical features in the trail portion of this ride after Idylberry Trail, one operative word that applies to the entire ride is "slippery". All of these trails were usually pretty rocky and were quite consistently covered in a loose layer of (natural) gravel regardless of the trail's smoothness at any particular spot. This not only meant that the occasional downhill segments on the way up could prove more dicey than you might expect, but it made me prone to slips even when walking up some of the steepest sections. I should point out that this information is based on a ride that I did in a very dry season. I doubt that wet conditions would alter this very drastically, because most of that loose surface material on the trails are at the granularity of gravel, if not larger. It does not feel like that would be packed down very much when wet, though I could be wrong. Interestingly, your first encounter with singletrack on the descent from the ridge does not happen on Big Rock Trail. There's a short connector called Buck's Bypass Trail that you take moments after the descent begins that not only helps you shortcut a junction of two fire roads but is the only public way of reaching Big Rock Trail, because that junction appears to fall on the other side of a fence that marks a private property boundary. While the fire road that you reach at other end of the short Buck's Bypass singletrack is labeled formally as Big Rock Trail on some trail maps, the singletrack portion of Big Rock Trail begins a little further down at a right-hand curve. It's well marked and hard to miss. Big Rock Trail is a non-technical singletrack, though some parts still require some attention due to loose gravel. There are a handful of rocky patches but they aren't nearly enough to entertain an experienced rider looking mainly for technical trail features. This trail is not about technical riding, it's more about a swoopy, flowing descent on a sweet and scenic singletrack. Most switchbacks on Big Rock Trail feature quite a judicious turning radius, but, at the time of my ride, the loose gravel I've already mentioned kept me on my toes on some of these turns. So watch out. Meanwhile, as I already mentioned, the trail is quite open to the sky (and surrounding views) in its upper half, where it only goes through a brief patch of trees. It begins to attain a bit more tree cover the more you go down but it's in full shade only for a few moments here and there and, right before it hands you off to Lucas Valley Road, it emerges onto an open meadow once again. Once you finish the descent on Big Rock Trail, virtually all that remains is a glide down Lucas Valley Road. The early parts of this descent are very twisty. That twisty portion of the Lucas Valley road is also a relatively narrow (though not dangerously so) mountain road and descends at a significant grade. Soon, however, the road nearly flattens out and becomes very wide while still nominally remaining a two-lane. Lucas Valley Road usually carries a moderate traffic volume. You would do well to be careful during the narrower and relatively steep part of the descent, but once the road widens, traffic stops being a consideration because you have a wide paved shoulder at your disposal. If you like what you see here but would like more of the same, there are a couple of clear possibilities to extend this ride. For those who can handle more tough climbs, one good option is to complete the loop on the southern side of Lucas Valley Road instead of descending back down the road itself. 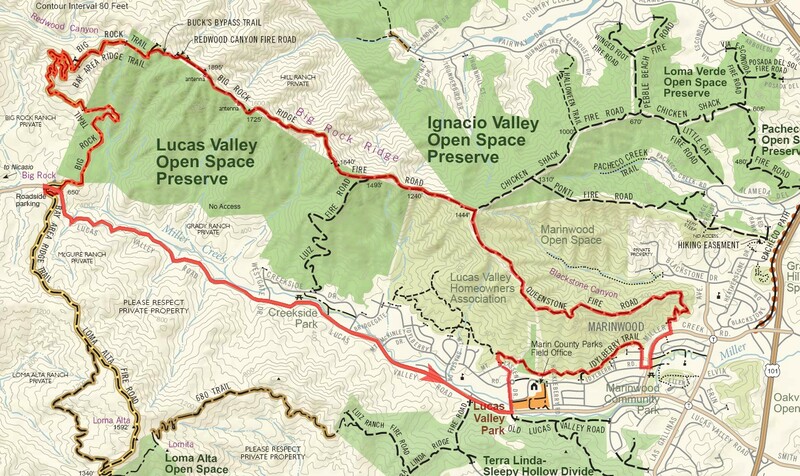 You can get onto Loma Alta Fire Road right from where Big Rock Trail meets Lucas Valley Road, and then follow 680 Trail, Luiz Ranch Fire Road, and Terra Linda Ridge Fire Road to be dropped back onto Lucas Valley Road a mere quarter mile from the intersection with Mt. Lassen Drive. Take a look at the original park map linked from this page to get a better sense. This would mean you bypass almost all of the road segment of the ride and will allow you more nice views from the peak of Loma Alta, but it will cost about 1600 feet of additional elevation gain and extend your ride by a little over 3 miles. A less ambitious way of adding a couple more trail miles to this route would be to replace the part of the climb on Queenstone Fire Road with a climb on Chicken Shack Fire Road. To do that, use the paved trail shown skirting along the freeway on the PDF park map by picking it up from the intersection of Miller Creek Road and Marinwood Avenue, and follow it to its end where it connects to Chicken Shack Fire Road by crossing Alameda del Prado. I don't think Chicken Shack has any shortage of steep spots either, but because it arrives at the same elevation by a longer route (and not too much elevation wasted in descents), it could be marginally more merciful than the corresponding climb on Queenstone.